My favourite quote - "I used to hate her. But now I feel only sorrow." If you were in the shoes of Snow White, would you be able forgive someone like Ravenna? Someone who murdered your father, imprisoned you, and made your people suffer. When Kirsten Stewart's Snow White was first seen on screen as an adult, she we see her reciting the Our Father. I was really surprised. But it lead me to think about the act of forgiveness, which is one of the messages in the film. In truth, the film has few lines that really struck a chord with me to really be called my favourite. However, the lines "I used to hate her. But now I feel only sorrow." did resonate with me and made me think about the theme of forgiveness. I have always said that I can forgive someone who has hurt me, but I will never forget that the person has hurt me. On top of that I will find it hard to trust that person again. What about you are you the forgive and forget type? 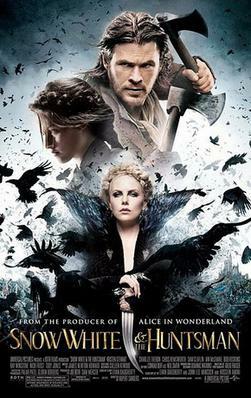 The theme of forgiveness is evident in the film through the backstory of both Snow White and Eric the Huntsman. When it came to the climatic battle between Ravenna and Snow White, I half expected her to throw down her sword and say "Kill me and spare the others" and memories of my Sunday bible class came rushing into my mind. It made me think back to a teaching that "if someone strikes you on the right cheek, turn to him the other also". Although I enjoyed most parts of the film, I found myself wondering when the film would get to the good parts. I think the film did a great job at establishing the world in this version of the Snow White story. However, I think that some parts of the film were really too draggy. I think what I enjoyed about the film were mostly separate scenes that were not always significant to the plot. The scene where Snow White connects and calms the troll down. I loved the way Kirsten Stewart played that scene. And kudos to the graphics guys. The troll made me feel as if there were an actor playing the role in a skin tight green suit, modeling for the 3D graphics guys. The scene where Chris Hemsworth's Eric cheekily says to Snow White "So you're back from the dead and instigating the masses. You look very fetching in mail." That tickled me to no end. I liked that few overtly affectionate words passed between Eric and Snow White. That you could sense and feel their affections for one another grow without much physical intimacy. Another scene that showed this very well was when Eric first realised Snow White isn't dead. Chris Hemsworth's surprise and feelings/affection for Snow White was very plain for all to see. I believe his performance said it all as to how his Eric felt about Snow White. And when Snow White was crowned queen, the way she was looking around for Eric and her reaction when she see him speaks volumes. When we first meet Charlize Theron's Ravenna, her performance was captivating! Snow White's father wasn't the only one seduced by her beauty, I was enthralled by Charlize Theron's performance. In fact, all the scenes with her made me sit up and pay attention. While I wouldn't say the Snow White And The Huntsman to be an awesome film, I would dare say that some parts of the film I absolutely love and throughly enjoyed. The concept of the warrior princess and the vanquishing of the damsel-in-distress type females in such fairytales or myths are not new. Keira Knightly was a warrior Guinevere in Antoine Fuqua's King Arthur (2004) as well. But I liked that Kirsten Stewart's Snow White managed to strike a balance between the victim and the warrior princess. She matured from a frightened young woman to become the warrior princess that allowed her to defeat the evil queen. The process may have been long-drawn, but she got there eventually. And even at the end, she did not revel in the queen's demise, but felt sorrow for what she had to do. Now Charlize Theron is an amazing actress, and in the film, what some call over-the-top and overly exaggerated acting, I call an award-winning performance. I saw her pain and understood her scorn for men. She was an evil character that I pitied rather than hated to the core. In truth, I think she stole everyone's thunder in this film. And you can't fault Kirsten Stewart for that outcome, because Charlize Theron just nailed her role perfectly. Chris Hemsworth's performance improves with each role and film I see him in. His Eric's suffering and self-loath is well-played by Chris Hemsworth. I almost can believe the chemistry between him and Kirsten Stewart. Through no fault of the two actors, who I think are good actors on their own. I don't think they have absolutely no chemistry. But I think theirs is a romance that is blossoming rather than the typical Disney-style full-blown Romeo and Juliet type romances. By the end of the film, I still walk away hoping they would finally kiss or fall head over heels with each other. So Chris Hemsworth and Kirsten Stewart must have done something right. Kirsten Stewart. I think she is still in my mind Bella Swan, and this hinders my ability to see her performance in Snow White And The Huntsman on its own. She nails some of the scenes in the film spot on. However, the scene where she tries to rally her people was kinda painful to watch. All the action in the film is great although the final battle was at some point pure confusion. Nonetheless, I enjoyed the world that Snow White And The Huntsman created and look forward to an expansion to the world created by the film. But for now, I will remember that if Snow White can forgive such an evil stepmother like Ravenna, then I can forgive the trespasses that has been done unto me. (1) This is director Rupert Sanders' first feature film. (3) Kirsten Stewart has acted in films like Panic Room (2002), Catch That Kid (2004), Zathura (2005), In The Land Of Women (2007), The Cake Eaters (2007), Into The Wild (2007), Jumper (2008), Twilight (2008), Adventureland (2009), The Twilight Saga: New Moon (2009), The Runaways (2010), The Twilight Saga: Eclipse (2010), The Twilight Saga: Breaking Dawn Part 1 (2011), and The Twilight Saga: Breaking Dawn Part 2 (2012). (5) Sam Claflin has acted in film Pirates Of The Caribbean: On Stranger Tides (2011). (6) Lily Cole has acted in films like St. Trinians (2007) and Imaginarium of Doctor Parnassus (2009).